God Eater 2: Rage Burst lets players battle the first Aragami on the floor at Tokyo Game Show. Rage Burst, an expansion of God Eater 2, will have Chrome Gawain, a monster whose long arms allow for fast yet far-reaching attacks. Those attending Tokyo Game Show will be able to battle this new creature on the show floor. Pictures from the expansion also give us clues into what we can expect from this title. The backgrounds look straight from the end of God Eater 2, which could possibly mean that a new story is taking place following the main game’s ending. Also, the protagonist is shown with mineral thorns sprouting from his back and arms. 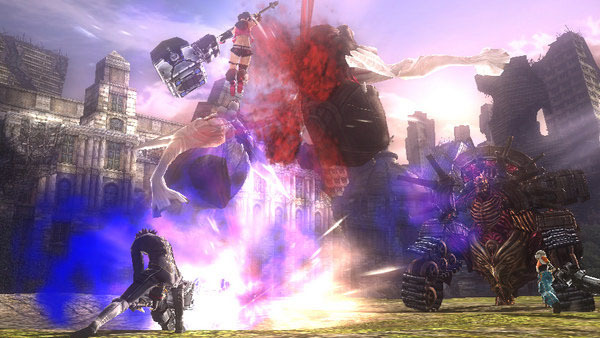 God Eater 2: Rage Burst is set to release in Japan in 2015. No date has yet been set for a worldwide release, which is unlikely due to God Eater 2 being a Japan exclusive. I actually think there’s a solid chance this could be localized, what with Namco opting to localize Sword Art Online: Hollow Fragment and Tales of Hearts R. I spoke to the Namco Digimon brand manager at PAX Prime and he said there was a strong push internally for Cyber Sleuth localization, so there’s a lot of Vita content already coming/being worked on from Namco in the West. Additionally, the Chinese market is currently experiencing a boom in video games, (which resulted in the creation of the English translation of Hollow Fragment). I wouldn’t be surprised if GE2: Rage Burst received the same treatment and thus happens to get a North American release similar to Hollow Fragment did. Evidently, this is all conjecture, but considering Hollow Fragment got localized against all odds, Tales went from a “No” to a “Yes” concerning localization and Cyber Sleuth is seemingly getting pushed internally (anecdotal evidence, I realize), I don’t think it’s crazy to say that there is, in fact, a decent chance that God Eater 2: Rage Burst could get localized. If it does get localized both ports of the game must be localized, if the PS4 gets it and not the Vita that will be a major blunder on there part (considering the console side never got the original game).